Caliport - Calibration Gas Standards | Australian Dynamic Tech. Caliport – Chemtron’s Portable Calibration Gas Standards for Detectors provide a cost effective and accurate way to calibrate your gas detector. Manufactured by Chemtron Science Labs Pvt. Ltd in their ISO 9001:2008 Certified Laboratory. Through their specialised analytical labs and fill facilities, Chemtron provide the best quality reference gas mixtures, designed to be precise and stable. They produce calibration gases in compliance with ISO 6142 and ISO 6143 standards, focusing on accuracy and traceability. They produce more than 15,000 cylinders and portables, serving segments such as refineries, petrochemical, pollution control, marine, power, steel, and fertilizer. 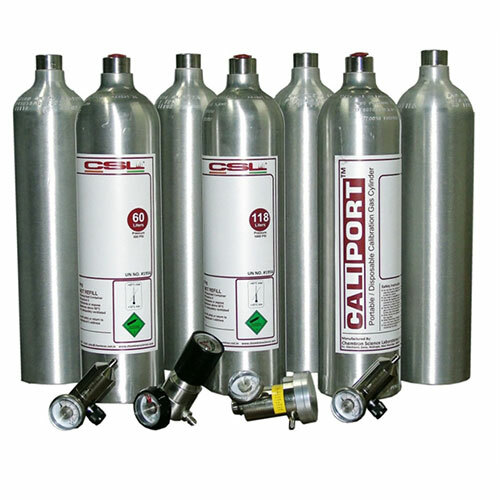 Caliport Calibration Gas is portable, economical and disposable. They eliminate the need for cylinder purchases and can calibrate up to 50 %LEL Detectors. They weigh less than 600 grams and are easy to handle which is particularly useful for remote, hard to reach, areas. Australian Dynamic Technologies are an authorised supplier of Chemtron products to Australia. Minor Components are Certified to the following Tol. CH4, CO, H2S and O2 in single cans. 4 Gas calibration of Detectors/Analyzer from one can.